1. Take the wheat flour in a bowl, add 1 tsp of oil and mix. 2. Add the grated cabbage, ginger-green chilli paste garam masala, coriander powder,turmeric ,coriander leaves & salt to the wheat flour. 3. Knead & make a dough by adding small amount of water as needed. 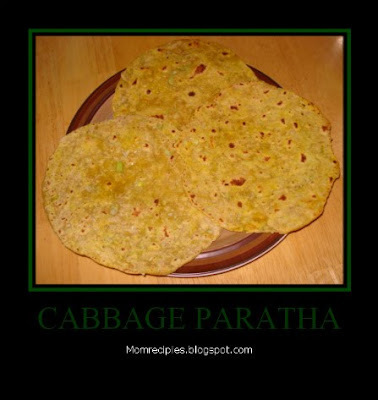 Don't add too much of water as cabbage will leave some water.You can add more flour if needed. The dough should neither be too hard nor too soft. It should be soft enough to make balls . 4. Make small balls and roll them into round parathas. 5. Heat tawa / Griddle and fry parathas on both sides on a Tawa by adding little oil to it till both sides turn golden. Serve hot with pickles or curd. We came across your blog and we think what we are doing would really interest you. Your blog is very interesting and a we are making a show on the same line. Its a FOOD TALENT SHOW which will be on air soon on a LEADING ENTERTAINMENT CHANNEL . healthy and yummy.. am gonna try this!